Do you like the look of the Classic 2 Magic accessory? Would you consider picking one up? Tell us below. So... does this work without modding the mini SNES ? @jobvd It is modding the SNES firmware.. (That's the installation part.) So, no.. Unfortunately it doesn't..
You are still better off just buying a RetroN for that price, instead of tampering with the firmware of your SNES mini! Looks like a $59 method of installing hakchi2. Or, and this might sound crazy to some, you could play these on an actual SNES. @LittleLion I thought the mini SNES was already moddable to play snes and nes roms without an extra machine. This adds a lot of other consoles though. Unrelated: I just bought that golden Famicom Mini. @jobvd No, not really. The original softmod that already exists, called hakchi2, already has a RetroArch add-on that adds compatibility for every 8 and 16 bit console, every handheld up to the GBA, and even support for N64 and PSX games, so this contraption here is just an expensive and rather unnecessary way of adding a software mod to your SNES Mini, much like @MarioFanatic64 already mentioned. ... For that amount of money, seems like it would be more worth it to just buy a RetroN. I have a RetroN 2 and I'd upgrade to the latest model before I'd buy this. Seems incredibly redundant when there are already better solutions for playing your SNES cartridges, and that it is so easy to hack the SNES Mini. False. Downloading ROMs that others have uploaded is not legally permissible, even if you own the physical cart. Think of this parallel: I may own a Star Wars bluray or a Beatles CD, but that doesn't mean it is permissible to download digital copies of those files that someone has uploaded to a torrent or something. Even making ROM-image copies yourself of games that you own physical copies of is, at best, a legally gray area. So many legal experts on hand at Nintendo life to talk us through the legal complications. @SimplyCinnamon53 "Using this is legal"
"There’s also the ability to play backup ROMs and copy ROMs thanks to the inclusion of a USB Drive. The accessory also allows various other video game emulators to be played on the SNES Mini and is even compatible with the NES Classic Mini." At best, this contraption is only half-legal, since it apparently advertises the use of ROMs. As for your question "where to download ROMs now? ", if you truly think that the sites that were recently closed down by Nintendo, or the sites like Emuparadise which have removed their Nintendo-related content, or sites like Coolroms (which by the way doesn't have any Nintendo-related content anymore either, nor does it contain any viruses) are the only good alternatives, then you should do some more research, because that couldn't be farther from the truth. There are still hundreds of locations left, some of which even of higher quality than Emuparadise, which is already one of the better sites, albeit not for Nintendo-related content anymore. I like that it looks like a piece of Super Nintendo kit from 90s, but its obviously not worth it. @Tsurii True, but newer TVs are becoming "HDMI Only" as far as hooks ups are becoming. 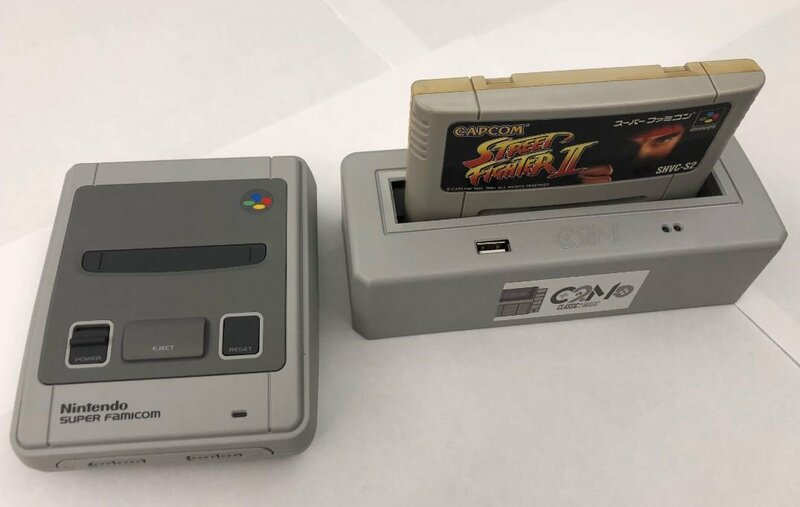 I'd imagine this would be an easy way to play SNES carts through a HDMI connection over say, buying a cheap HDMI convertor for meh to okay results, modding the console to have HDMI, or buying something like a framemister for that sweet picture quality on a HD/4KTV. @Tsurii Actually it is. Actual SNES are rare as hell these days. You're talking about a 20+ year old console there. I doubt about the region lock thing considering some PAL SNES games ran self-checks to see whether they were running in 50Hz or 60Hz and would lock with a nice message if 60 was detected. Bold promise but I demand to see, cause I bet they didn't think of that at all. Debates over Legal / Ilegal about ROMS. I will prepare my pop corn. I am surprised that Nintendo hasn't shut this place down yet the way you guys glorify hacking and pirating. And then we ALL here will be Banished forever. @SimplyCinnamon53 The 'ROMS are illegal' argument is played out. Nobody cares. @Tasuki Nintendo doesn't have the power to shut down a forum. @Tsurii An actual SNES? That outputs in composite? I use the Super Retro Trio 3 Plus because it outputs in HDMI. It costed $80 but plays NES, SNES and Genesis games. So does this thing dump the rom from the cartridge to the system or do it only kept the rom there temporarily and can it be copy to the SD Card? Would be a nice device for backing up games you own if that's the case too since more and more emulation sites are going the way of the dodo now. @ThanosReXXX I believe when they made their emulator they probably made it just for those 21 games they meant to include so every other weren't that big of a deal for them as long as the thing sell. Had they gone with RetroArch it would be very nice and made the system better but would not be possible since RetroArch is freeware and is easily hackable so Nintendo probably thought their version wouldn't be hackable. Also sorry I delete my original comment, I wasn't sure if anyone would care. @MegaVel91 try actually looking for one, if you think it's difficult, or expensive, to get one these days. @Angelic_Lapras_King sure, but decent composite/hdmi adapters aren't exactly expensive either. And if you want to go the full distance/do it as perfect as possible, you're most likely willing to pay unholy sums for your retro goodness anyway. @Tsurii It's easy to find if you just want one but to find one that is in good working condition would be difficult. I found 2 at a thrift shop the other day but I would admit even I wouldn't buy those, the plastic on those look nasty and are yellowish, one had a damage power switch and the other is missing the dust cover which I could see still had endless amount of dust inside. I say if you still had the money just get an Analog Super Nt, they are still available and will make all your old games look new again. What a completely pointless attachment, it is ridiculously easy to add as many roms as you wish to the SNES mini in about 5 minutes so why bother with this? @Tsurii Those composite to HDMI adapters are terrible, not only do they do a poor job of upscaling the picture but they also introduced lag which makes some retro games like Donkey Kong Country and Super Street Fighter II completely unplayable. So not only do you get uglier resolution, you also get laggy gameplay and no turning the settings on your HDTV to Game Mode won't help either as the lag came from the adapter and not the TV. It's one of those reason why I didn't bother getting the Framemeister since it introduced way too much lag despite the high price. If you have an original SNES either hack it to get RGB running through HDMI or just stick to CRT TV. @carlos82 I think they made this for those who still had their original Super NES cartridge lying around and don't want to hack their system. To that I say this is a good solution as not everyone wants to tamper with stuff they own. @carlos82 same here - Best way to play these games IMO. What monitor do you use? @SimplyCinnamon53 ROMs are still VERY easy to find. @retro_player_22 No need to apologize, i wasn't offended, and of course, you are free to do whatever you want, with your own comments. The emulator used in the SNES Mini is about 80% compatible with the NTSC catalog on the SNES, but there are some problem titles. And some PAL titles don't run at all, but when used in combination with the RetroArch add-on, the SNES Mini offers a near 100% compatibility. You might as well just buy both a SNES Classic and an original SNES if you're going to be using both the SNES Classic and physical carts along with this additional box. I mean, an original SNES likely costs less anyway than this box anyway. And you can still flash all the digital SNES games onto the SNES Classic too using something as simple hackchi 2--and it really is simple. So I kinda don't see the point in this solution to be honest. And like I said below: If you additionally want to be able to play your physical SNES games too on some box--get an original SNES for probably less than this box. @retro_player_22 - Except for the fact that what this does is HACK YOUR ORIGINAL (notice in their installation video they hold the reset button while turning on the system in order to place it into FEL programming Mode so the device can install the new firmware onto your SNES mini !!) — It actually overwrites the nintendo firmware on the mini making it no longer a licensed Nintendo product just like Hakchi does only it does it without telling you it is doing so — No telling if your SNES will still work if you detach the add-on since the original firmware has been replaced and they do not say whether it backs up the firmware so that it can be uninstalled or whether the change in firmware renders the original system useable without the add on hardware ( what happens if you unplug this does the changed firmware on the SNES still run the original SNES mini games or does it just black screen since it is looking for a piece that is no longer attached ?? At least with Hakchi you can remove it and revert your SNES to original if you decide to this thing may not even backup the original firmware so that you can remove it so the SNES may be unuseable without the device attached after first install ! @jobvd — No — WHen you install this it Writes a new Firmware to the SNES mini replacing the NIntendo firmware - so in effect it mods the SNES for you - Now whether the SNES mini is still useable without the device plugged in depends on the firmware they wrote - it may only work if their hardware is connected and tehy may not have included a way to run the SNES mini on the new firmware without the device plugged in or they may have the firmware run the original games if no device is found ( they do not tell us so no way of knowing !) — at best you no longer have a licensed Nintendo SNES mini and have invalidated your Nintendo warranty since it has changed the firmware and it may no longer work on it's own or be removeable without finding a copy of Nintendo's Firmware to change back — Or they may have included a way to uninstall their firmware as well (so they backup your original firmware before installing theirs) — But they do not tell you since everything is automated and there is no way of knowing until someone installs it and tells us. giving folks the business since sun 12th apr 2009. @MegaVel91 I don’t think SNES consoles are that rare. One can get a used working SNES easily for 60-70 euros with cables and a controller. Loose games are quite cheap too. @Angelic_Lapras_King This would be the main reason to buy one of these as the original does not have HDMI. Otherwise I don’t see a point for this as it seems to Flash the MINI SNES firmware. If only this was an add-on that was just plug and play with no firmware mods to the console. I'm glad I have a Retro Freak and can play everything and save the roms directly to the system. You people arguing... and here I am enjoying my 100+ classics on my SNES mini. ..and do you tuck Nintendo in at night too? @Syrek24 If a person can download Super Mario 64 for free isn't it thievery for Nintendo to charge $10 for each download? Meh, just get a Raspberry Pi, Retroflag NESPi Case+ and RetroPie. Then you have access to all the game consoles from back then and a ton of games! @Crono1973 lol.... no, but that’s was in case that anyone used the piracy argument and that I’m stealing from Nintendo or something. Is it just me or are all the ROM arguments complete dead ends? Shouldn't we appeal to our governments to rewrite the copyright laws? lol, not really worried about the 8bit console police running around to check if ROMs are legit or not - not worth it to them for these ancient titles. Now, on the other hand, you are setting up multi-ROM arcade systems that you are going to make money off of, well, that's another matter entirely. @3bodyproblem Many people think they can just play the 'it's illegal' card and win the debate. Truth is, most people just don't care if it's legal or not and will just ignore such a simple argument. I would also say that most people know it's illegal and telling them that it's illegal is not useful in any way. @Crono1973 the legality is common knowledge. i think the real argument boils down to the same thing as most stuff on the net. the whole i'm right and you're wrong argument. ppl love that sht and i find it detracts from what is possible. about the device & article. personally don't care if roms are illegal since it isn't very difficult to create a board to read data from any media. there are guides online, if you can solder and follow instructions (and have free money to blow lol). it isn't illegal to hook your SNES up to your computer. you own the data on the cart (don't distribute or alter it). i pay 100+ for a cart as an investment as a last resort. finding one without a label/damaged for cheap doesn't bother me to dodge that. seriously don't get that argument either. also can buy japanese carts and use a language patch for wicked cheap... so. where there's a will there's a way. @the_shpydar in the eyes of the law you can make your own copies for personal backup only. You are not however allowed to share or distribute your back up. Is it illegal to buy unbranded underwear and Wear them? No. This must surely win the prize for the most ridiculous add-on ever? Did they not get the memo that you can easily mod your system? For the cost of this you could get a real console fully region modded. @Mangini ' waste your min with your roms' what does that mean? @YANDMAN This must surely win the prize for the most ridiculous add-on ever? To people who prefer to play their original cartridges when possible, this isn't ridiculous at all. Is that something that you just can't imagine? @CCore28 Takes 5 minutes to hack it and there are no risks that I have found. The Analogue Super NT is way better than the Retron if you are going for just SNES, plays the games exactly the same as on original hardware and can be modded to play them off the SD slot. @Mangini Just hope they paid attention to the licensing on those emulators. RetroArch has quite a few that have specific non-commercial licenses for them. Retrocade and a few other companies have already run into them. As for the system itself, with the exception of cartridge support it is doing little that Hachi 2 CE cannot do. I wouldn't be surprised if they just created a hardware wrapper around Hakchi2 CE since it supports USB Host plus Wireless connectivity for various purposes. @boop22 Maybe you should shop somewhere else, that store sounds like a rip off. A SNES with Super Metroid shouldn't even cost $100, let alone $150. @the_shpydar Cool. No one cares though. I have no problem doing it. @Syrek24 has nothing to do with that. We want to play our SNES games on the classic. Classic didnt include all of thr games we own, nor all it should have come with. The classic even has illegal roms on it straight from Nintendo. No sense in white knighting Nintendo. They expect us to do this. Hence the message in the code. @CCore28 Not a fan of RetroN's source code thievery, better off getting a Super NT. What's the point of this when you can just buy a more functional clone console that plays SNES cartdriges (among other things) for a similar price? @Crono1973 I have an actual console for playing actual cartridges on. Why would i want to link up my cartridges to my mini? @mikegamer @MarioFanatic64 this C2M also bundles stolen and unlicensed code/data. It's a shame NL didn't call them out on that. Guess what I found, it is sold it Amazon, https://www.amazon.com/s/ref=nb_sb_noss?url=search-alias%3Daps&field-keywords=classic+2+magic+snes&rh=i%3Aaps%2Ck%3Aclassic+2+magic+snes, maybe I need to try one. Hi we're would I be able to get one of these from ? I'm based in the UK .